Culinary delicacies from all over the world are on offer, and international music and cabaret artists perform. Numerous tents devoted to musical performances, circus shows, music hall and stage plays delight audiences. More than 70% of the acts appearing are free. There are also many stalls selling craft items, jewelry and things from all over the world. Definitely worth a visit. During the Christmas period, another Tollwood festival takes place, this time on the Theresienwiese, where the Oktoberfest happens. This is very much an alternative Christmas market, Tollwood AND and Christmas market all rolled into one. Well worth a visit too. 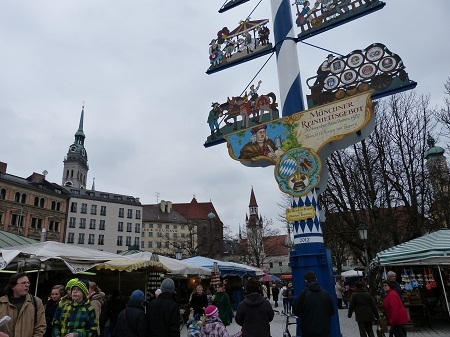 Munich has lively market scene the mostfamous of which being the Viktuelienmmarkt behind the Marienplatz. Taken on a cold April day recently in 2013. The Viktualienmarkt, a the bustling, colourful food market at the end of the pedestrian zone off the Marienplatz, is one of the city’s major attractions and has existed on the site since 1807. At the heart of the market is a traditional maypole surrounded by a beer garden. On a warm summer’s day it’s a great place to shop and have a beer, it’s a must see to get some old Munich atmosphere. The range of products at Elisabethmarkt is very similar to that of Viktualienmarkt. Cheese, meat, fowl, wine, herbs, bread, delicatessen, fish, fruit, vegetables, flowers and organic products, and even home-made beer are offered at the 24 stalls between Arcisstraße, Elisabethstraße and Nordendstraße.